The last surviving Tasmanian Tiger died in captivity in the Hobart Zoo in 1933. The Thylacinus cynocephalus looked much like a dog, except when it opened its mouth. It had the largest gape of any mammal (120 degrees), meaning that when its jaws were fully open it was a fearsome sight. Its tail was very long, and thick, and its “tiger” moniker comes from the stripes that patterned its lower body. It has become emblematic in Tasmania, of hope, of environmental awareness, of an undying wilderness, because of course there are people who believe they still exist. Sightings are reported yearly, but no one has ever come forward with unambiguous evidence that the tigers are out there. They have become modern mythology. With that dreamy cultural tradition as its starting point, The Hunter cannot fail to enthrall. The story begins with Martin David (Willem Dafoe) waiting in a hotel room in Paris for an assignment. He is a methodical man, diligent about personal hygiene, and, like all great hunters, much more comfortable working alone. He is given a strange assignment by a corporation with interests in the Tasmanian bush: Find the last Tasmanian Tiger and kill it. 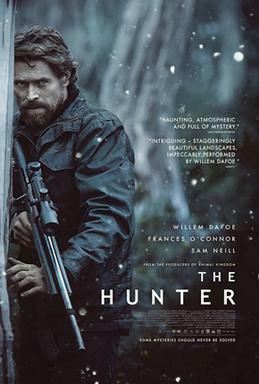 Adapted from Julia Leigh’s 1999 novel The Hunter, a film like this is a hard sell for mainstream theatres. It is a moody narrative that winds its way up into the forest, following a solitary hunter setting his traps and camping in the capricious weather of Tasmania. But that is only part of the story’s focus. Posing as a scientist investigating Tasmanian Devils, Martin David lodges with a local family chosen for their alienation from the greater community. Unbeknownst to David, he has fallen into a low boiling conflict between environmentalists and native loggers who bristle at any attempts to halt their work. It is a matter of employment, not ignorance, that sparks the hostility, and while David remains he is seen as a threat to the native way of life. As you can probably guess, there is much more happening behind the scenes than what we’re told at the beginning. The conflict between loggers and “greenies” is a real one, but much more compelling, and where the movie takes us, is into the home of David’s host family. With their father missing and their mother in a self-medicated coma, the house is maintained by Bike (Finn Woodlock) and Sass (Morgana Davies) Armstrong, young brother and sister eagerly hoping David has come to find their father. Out of his element with the children, David is at first annoyed by them, but is not beyond common human decency. When he returns from his expeditions in the bush, he is gradually compelled to set their house back in order. Every shot of The Hunter is a beautiful composition. It doesn’t hurt that over half the movie is filmed on Tasmania’s fertile Central Plateau. Dafoe trained with a master bushman/survivalist to get all of the traps and movements right, and he looks exceedingly comfortable alone amongst the elements. And what elements. There is a palpable love behind the camera for both Tasmania and the story the filmmakers tell, who make ample use of natural light and the greens and blues and blacks of their epic canvas. It is a small cast that inhabit it, a perfect example of how much is expressed with such a sparse script. The Hunter presents us with a subtracted family, a small town, and a vastness of creation that, though mapped, is easy to lose oneself in. There is a loneliness to the Tasmanian bush, but also a great beauty and an overpowering secrecy to it. An extinct creature might very well be hiding in its leagues. There is more to Martin David, an entire unspoken biography, a man without a country or home of his own, than his assignment. We see it in glimpses, in the way he prepares his traps, avoids talking about his music. And there is more to his assignment, too. As he inhabits the role of the Armstrongs’ lost father, learns more about the Tiger and what it means to the locals, what it means to his client. If it exists, his hunt may not be worth the sacrifice. This is a quiet and beautiful movie about the big things that make us small.